During this course you will drop a massive amount of baggage and peel many layers of pain off of you… revealing your true self. The 7 Steps to Reprogramming Yourself was invented by Arnoux Goran in 2003 and has literally changed the lives of thousands of people. During this course you will drop a massive amount of baggage and peel many layers of pain off of you… revealing your true self. Releasing all of the grief around my father’s death. We were very close and now I don’t cry when I talk about him, which I always did before. I now get along great with my mom and she has never criticized me since I erased that issue from my unconscious using The 7 Steps to Reprogramming Yourself. My brother and I now have a relationship after years of no contact. That was also a result of The 7 Steps. 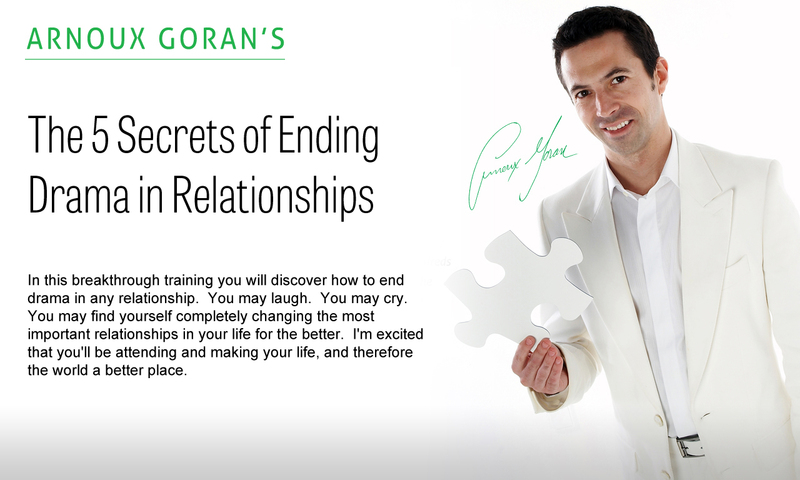 In fact all three of these relationships totally changed after just 1 session with The 7 Steps. There is so much more I could say, even my ability to speak in public has totally changed. The biggest thing may be that I now have the tools to make even more changes, not just for myself, but for others. I feel truly blessed. The results have been AMAZING, I don’t think there are enough words to describe how FANTASTIC the results are, in fact, ‘life changing’ doesn’t give it enough justice because it’s so much more than that. Already I’ve gone from size 12 to 6, got off 3 allergy medications including steroids, 2 prescriptions for chronic back pain (muscle spasms & sciatica) removed heavy metals, got rid of arthritis & joint pain, and NO more Migraines!!! Severe insomnia has gone away and I can now sleep in my bed after a year (the back pain & insomnia relief alone has been an absolute blessing!). I’ve cleared TONS of emotional blockages like issues about self-acceptance, being able to receive love, and relationships with others improved. I’ve learned how NOT to hold on to others negative or painful emotions (extremely difficult to do before and was really hurting me physically). I’ve even noticed a huge difference with my dogs after switching them over to the healthy dog food!!! It’s such a relief to FINALLY accept myself for who I am, especially spiritually. Learning how to create an INTENTION and seeing it manifest within five minutes is so POWERFUL! I just can’t say enough, and we’re only halfway there! This has been the greatest blessing ever, and I am eternally grateful to Arnoux! Namaste. I was able to manifest the exact job I wanted using Arnoux’s techniques and tools to remove money blockages. Arnoux Goran is a tremendous resource offering a wealth of knowledge for anyone seeking to improve their mental, physical, emotional and spiritual health. He speaks from personal experience and the testimonies of many he has helped. Even from applying a small fraction of the information I have learned from his teachings, I have lost weight, successfully discontinued medications for ADHD, anxiety and depression and increased my overall sense of well-being by releasing emotional baggage from the past and increasing my energy for challenges I currently face. The information is also of benefit for my loved ones who suffer from diabetes, fybromyalgia, Crohn’s Disease, and adrenal failure. I am thankful for this information, which I am certain has changed the course of my health to avoid these conditions my family members have developed.